The politicians attending Tuesday's rally agreed. A number of local representatives — Congresswoman Carolyn Maloney, Borough President Gale Brewer, City Council Ben Kallos, State Senators Liz Krueger and Jose Serrano and State Assemblymembers Dan Quart and Robert Rodriguez — submitted a letter to NYCHA containing more than 30 questions about the plan. "Funding for NYCHA repairs should not come on the backs of NYCHA residents, especially children who will be losing their light, air and playground for little in return," Kallos said in a statement. On May 17, NYCHA announced that Fetner Properties won a bid to construct a 47-story apartment building on the site of the Holmes Tower playground. The new building would contain hundreds of apartments (estimated at 350 by area politicians), half of which would be offered at market rates and half at affordable rates. But politicians and residents have argued that the affordable rates would actually be unaffordable for public housing residents. Residents also argued against the size of the building. Taylor said Tuesday that the new building will tower over the rest of the Holmes Towers, with new residents effectively looking down on the NYCHA residents. “They’re not writing judicial-style decisions that provide findings of fact or issues of law,” Ben Kallos, chair of the Committee on Governmental Operations, told the NY Press. Singer said that the BSA does not oppose this but argues that it already takes into consider community board recommendations already. Other bills include extending the time frame in which developers or the community could appeal a decision rendered by the BSA from 30 days to four months. The Real Estate Board of New York, an influential trade organization that represents the real estate industry, is opposed to it, arguing it could unfairly delay a developer from starting construction. Such delays, the trade group argues, could be costly. One of the bills would impose a $25,000 fine for a material false statement during the application process. Currently it is not illegal to make inaccurate statements or put forward incorrect drawings, Kallos told NYPress. City Council Member Costa Constantinides, Majority Leader Jimmy Van Bramer, and state Senator Michael Gianaris on December 9th called for an end to the use of numbers 6 and 4 fuel oil in power plants. They were joined by the Astoria Houses Tenants Association, Queensbridge Houses Tenants Association, Ravenswood Houses Tenants Association, Jacob Riis Senior Center, Urban Upbound, American Lung Association, Asthma Coalition of Queens, and WeACT. Ending the use of Number 6 and 4 oils would help reduce emissions produced by the plants in order to meet goals set by the Environmental Protection Agency’s Clean Power Plan. They called on the power plant operators to demonstrate how they plan to comply with Local Law 38 of 2015, which requires that they phase out use of number 6 oil in plants citywide by 2020. They also called on the plant operators to phase out use of number 4 oil sooner than the scheduled 2030 phase-out. Numbers 6 and 4 oils are considered to be the dirtiest grades of oil available. They are linked to air pollutants that pose risk to public health, including particulate matter, nitrous oxides and sulfur dioxide. According to the Manhattan councilman sponsoring five of the bills—which are to be heard Wednesday by the Committee on Governmental Operations—the board is too frequently persuaded. In 2011, it approved 97% of applications, many of which were opposed by local community boards. "We are taking away the rubber stamp from a government agency that used it far too often over the objections of residents," Councilman Ben Kallos, chairman of the committee, said in a statement. "Developers will have to be honest." Making a false statement on an application would trigger a $25,000 fine, according to one of the bills sponsored by Kallos. Another would require the board retain a certified appraiser to pore over financial analyses to better vet applicants' claims of financial hardship. Other bills are designed to increase transparency and incorporate opinions from elected officials into the board's considerations. Together, the measures would more thoroughly scrutinize developer's claims of hardship and potentially make it harder to get a zoning variance from the board. City officials are trying to address at least one aspect of the problem. Councilman Ben Kallos, along with several colleagues, including Councilwoman Helen Rosenthal, have introduced legislation that would permit artists or art groups to rent, at a reduced rate, city-owned or city-run spaces for after-hours rehearsals or performances. The venues could include Beaux-Arts spaces such as Manhattan’s Surrogate’s Court lobby, which rises three stories and whose marble staircase and other features recall Paris’ Palais Garnier Opera House. The Tweed Courthouse on Chambers Street and the Marriage Bureau in the Louis Lefkowitz Building on Centre Street could also become available. 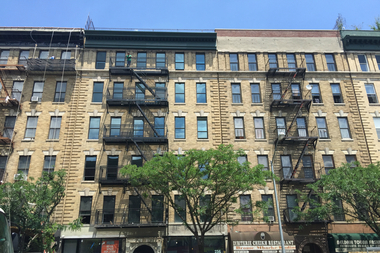 NEW YORK CITY — Companies that create so-called "tenant blacklists" — used by landlords to deny prospective renters from getting apartments — could become regulated under a new piece of City Council legislation. The "blacklists" are created using housing court cases but the reason for the court case and its outcome are often not included in the reports, officials said. The lists are sold to landlords along with credit reports. "We are rebuilding the East River Esplanade brick by brick and dollar by dollar to connect 60th street to 125th street in one seamless park," Kallos said in a statement on July 11. "John Finley Walk from 81st street to 84th will receive the attention it needs to go from roadway to greenway." “The law hamstrings case law over and over again, and sometimes that law goes against what everyone wants,” Kallos added. But he admitted that elected officials are restricted in what they can achieve in office. “Everyone from the city council member to the U.S. president” is faced with the same problem: “wherever you go, somehow you don’t have the power,” he said. Councilman Ben Kallos, a Manhattan Democrat who leads the council’s governmental operations committee, said the report “confirms some of our worst fears” about the role city officials played in the deal. The report raised a number of questions about the administration’s timeline and account of the deed removal. A group of gun violence survivors joined lawmakers in Manhattan Wednesday to call out Congress for laying down to the NRA. The “sit-in” at Carl Schurz Park on E. 86th St. was led by Rep. Carolyn Maloney (D-Manhattan) who demanded that House Speaker Paul Ryan hold a vote on legislation aimed at tightening background checks and preventing terror suspects from buying guns. A bill introduced in the City Council on Tuesday seeks to expand on and codify the practice of optimizing city websites based on the analytics of their visitors. Councilman Ben Kallos, chair of the Committee on Government Operations, introduced the legislation. It would require the Department of Information Technology and Telecommunications to ensure that all agencies use web analytics in maintaining and designing their websites. A group of families celebrated Father’s Day last Sunday by participating in a union strike at 1735 York Avenue and E. 90th Street. But city officials and local groups still took issue with the legislation and the timeline. Councilman Ben Kallos opposed the bill yesterday when the land use committee pushed it through to go for a full council vote. Kallos, who represents the Upper East Side, rallied outside City Hall with preservation groups before Tuesday’s vote over the timeline and limited options in terms of getting that extended, as New York Yimby reported yesterday. By putting a deadline on the system, they argued, the community would have less input in the landmarking process. Meanwhile, the real estate industry has supported the bill. At a Real Estate Board of New York event last night, the organization’s president, John Banks, said the legislation was a middle-of-the-road compromise. Councilmber Ben Kallos of the Upper East Side wondered if throwing more money at the B.O.E. is the answer. Kallos is an I.T. geek who prior to being elected to the Council designed an online database called VoterSearch.org. He practically scoffed at Ryan for not being able to keep track of voting stats, and asked why B.O.E. staffers and poll workers can’t be hired through public job postings under a “merit-based” system, instead of the current patronage mill we have now. Mr. Kallos said the Rivington deal was disturbing, in part because it allowed a building once designated for a nonprofit to be turned into condos when the city could have used the space for other needs. “We need schools like you wouldn’t believe. We also need homeless shelters. And affordable housing,” he said. Ms. Camilo said agency officials shared council members’ concerns about the Rivington deal. “No one was happy with the outcome,” she said. DCAS is in the process of revamping the review process to include more public review. Right now, the main notification is a brief appearance in the City Record, which you can view here for some light reading. A fix is necessary to stop those looking to make a killing on land, that most precious NYC quantity. Besides profits there are a few other things we need in NYC — truly plentiful and affordable housing, schools and homeless shelters, as Councilmember Ben Kallos noted at Friday’s hearing. It would be a shame for none of those needs to be addressed on plots that were intended to be preserved. But those are the current rules of the game.